Now that the short but tense World Series is over, I miss baseball. During our lull before springtime, we can look back to a time when baseball was especially missed: the 48 day work stoppage in summer 1981. 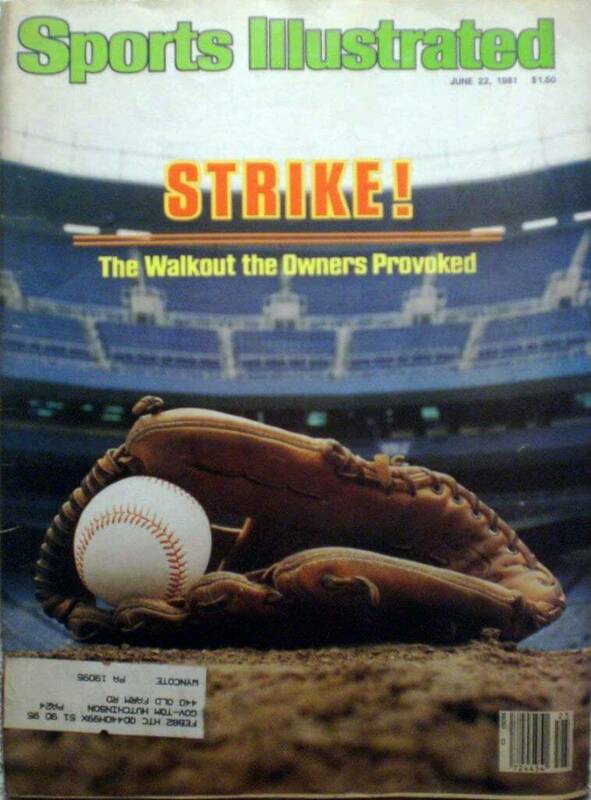 Earlier, in 1972, a strike cancelled the first 13 days of the season. Later, in the 232 day lockout from August 1994 – April 1995, there was no World Series to miss. It is worth nothing that the minimum major league baseball salary today is $555,000 and the average salary is $4,520,000. It wasn’t always this way, of course. In 1981, the minimum salary was $30,500 and the average salary was $185,651. Adjusted for inflation, in 27 years the minimum and average increased by 520 and 740 percent respectively. In 1981, Dave Winfield was the highest paid player, having signed a 10 year/$2.3 million dollar contract with the New York Yankees paying him $1.3 million that year or about $10,000 per game. An All-Star considered maybe the best in the game at the time, Winfield was paid a couple of million less than the equivalent today of a journeyman, left handed middle reliever. In contrast, over the course of Alex Rodriguez’s 10 year/$233 million dollar contract ending in 2017, he earned about $56,000 per plate appearance. In 2018, the Boston Red Sox payroll was $22,398,869 and the Los Angeles payroll was 196,591,904. As seen in Baseball was better 45 years ago, in 1971 only a dozen players had broken the $100,000 mark (about 600,000 in today’s dollars). The entire payroll of the Texas Rangers was 194,000! Before 1976, baseball maintained a “reserve clause,” mandating that players were bound to the team that originally signed them to a professional contract and if traded or sold, players were then bound to that team. Players were not free to sell their services to any other teams on an open market. 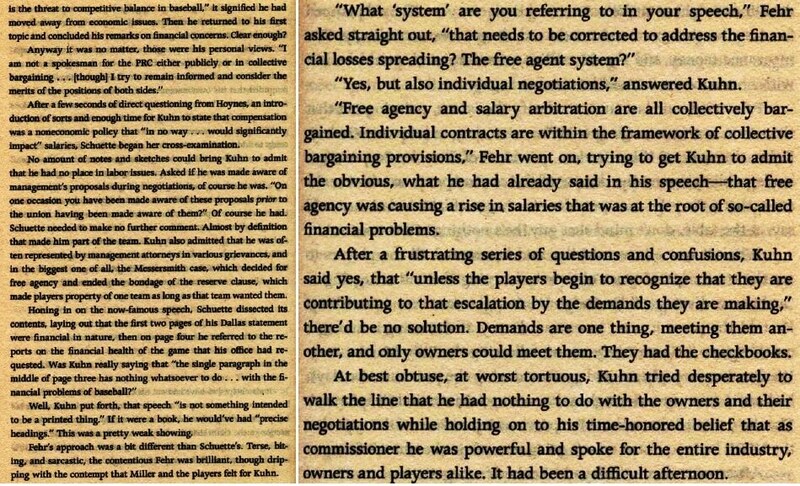 in 1975, a ruling by arbiter Peter Seitz effectively nullified the reserve clause, resulting in a system of limited free agency. In the new system, salaries skyrocketed (relatively). In 1975, the minimum salary was $12,000 ($32,500 in 1981) and the average was $42, 676 ($185,651 in 1981). Go back only eight years earlier to 1967 and the minimum and average were $6,000 and $19,000. In 1967, the median household income was $8,000 (usually by one male breadwinner) so a veteran player was in a solid middle class tax bracket. Today, the average player is a 1 percenter. As salaries increased — and the richest teams could outbid the poorest teams — the owners sought to further limit free agency and salary arbitration. Hence, lower player salaries and less voluntary player movement. As described by Jeff Katz in SPLIT SEASON: 1981 (2015), negotiations were bitter and frequently stalled even as the games went on. 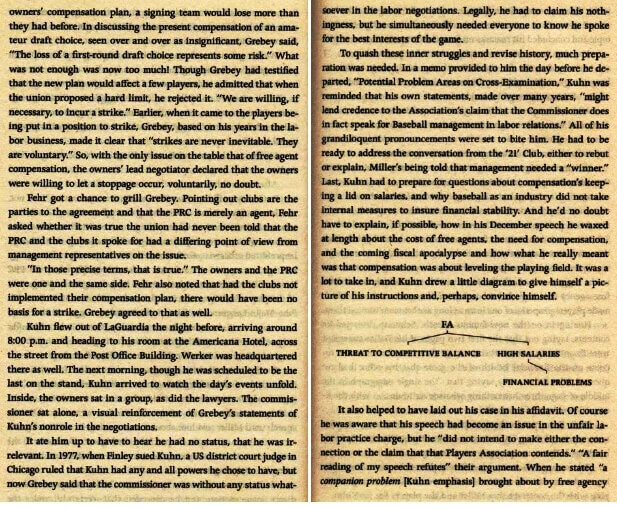 As the 1981 season proceeded, the National Labor Relations Board — on behalf of the Major League Baseball Players Association — claimed the owners were bargaining in bad faith, especially by not revealing their financial status and by goading the players into striking. The NLRB asked for an injunction allowing negotiations to continue and the players to continue playing and continue to be paid for up to 12 months. Here’s where Rochester comes in. According to Katz, the injunction case was slated for US Judge Henry F. Werker in Manhattan. However, at the early June dates when the hearing was scheduled, Werker had to be in Rochester for two weeks of criminal casework. So the venue changed to the Kenneth B. Keating Federal Court House and national reporters, baseball and union official flew upstate with most staying in the old Americana Rochester Hotel down the street from the courthouse. The June 3rd and 4th hearings were a bonanza for the Democrat and Chronicle. 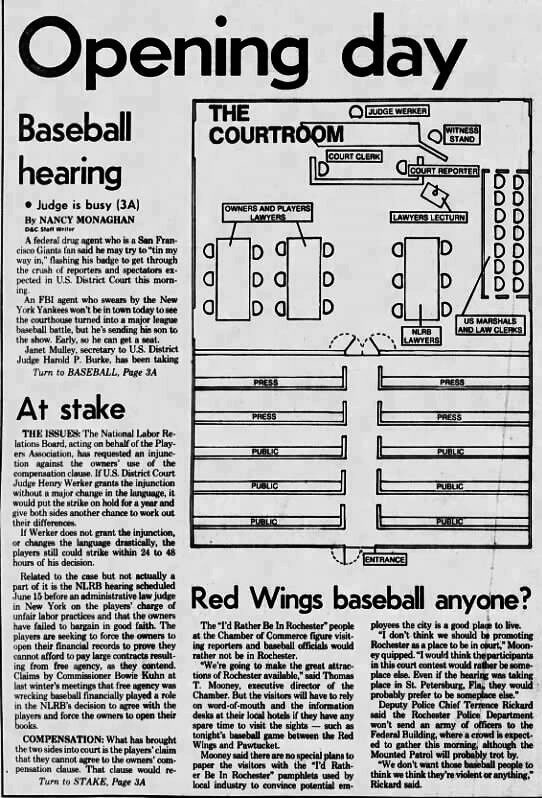 In town on the management side was American League President Lee McPhail, Peter Bavasi, President of the Toronto Blue Jays, C. Raymond Grebey, chief negotiator, and Commissioner Bowie Kuhn who testified. On the union side was MLBPA Executive Director Marvin Miller and Chief Counsel Donald Fehr who would later lead the union. 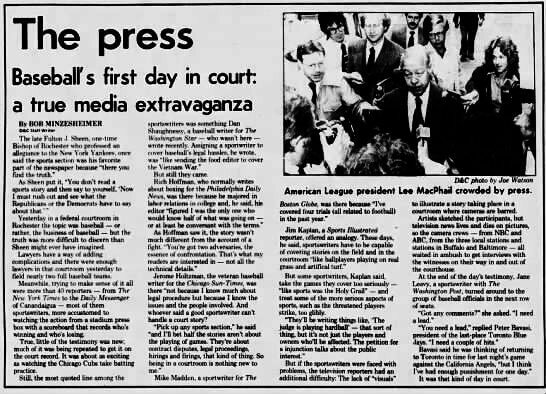 As see in D & C staff writer Bob Minzenheimer’s “The Press: Baseball’s first day in court,” the event drew more than 40 reporters from “The New York Times to the Daily Messenger of Canadaigua,” including Steve Towney of the Philadelphia Inquirer, Hirth Hoffman of the Philadelphia Daily News, Jerome Holtzman of the Chicago Sun-Times, Mike Mahlen of The Boston Globe and Jane Leavy of The Washington Post. Along with the three local tv stations, NBA and ABC covered the proceedings, as did local stations from Baltimore and Buffalo. 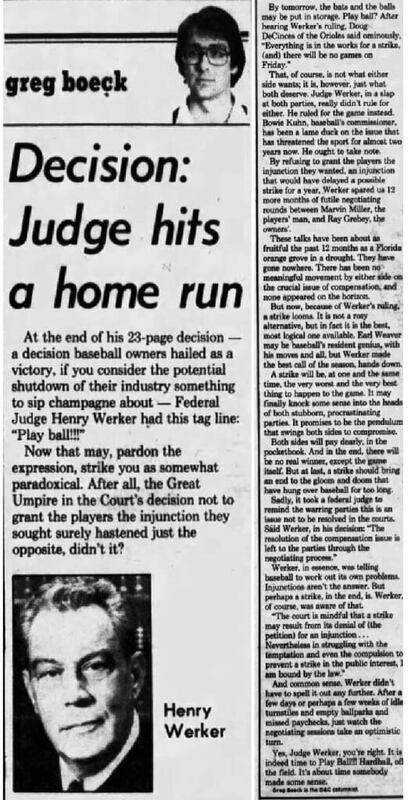 For Tony Destino, Rudy Martzke, Rick Wheeler and Greg Boeck, D & C sportswriters toiling in a more-or-less provincial mid-sized city, the injunction hearing a was manna from heaven. Combined, they wrote close to ten stories, including ones that made the front page on three straight days. June 3rd opened on a light note. In the morning, Iggy St. George, a probation officer, entered the court. The print and tv reporters mistook him for Marvin Miller and rushed for an interview. When the mistaken identity was clear, St. George explained he was there to a set up a golf game with Judge Werker who he knew. And, at 4:30 p.m. when court was adjourned, the two headed for Brook-Lea Country Club. Democrat and Chronicle, 04 Jun 1981, Page 1. 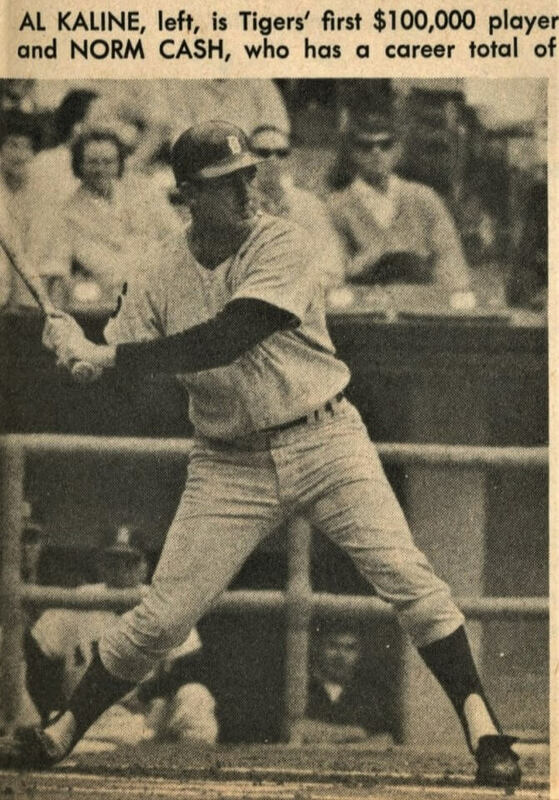 Kuhn mentioned he was in Rochester three times before, including a 1975 Red Wings game at Silver Stadium — featuring a home run hitting contest — along with 14,000 other fans. As explained by Rick Wheeler, the owners and commissioner Kuhn adamantly insisted that free agency as it now stood would bankrupt the teams and ruin competitive balance. If it took a strike to save the game, so be it. (Both arguments would ultimately be proven wrong. As tv revenues soared and taxpayers helped build state-of-the-art stadiums, revenues skyrocketed, more than enough for increased compensation. 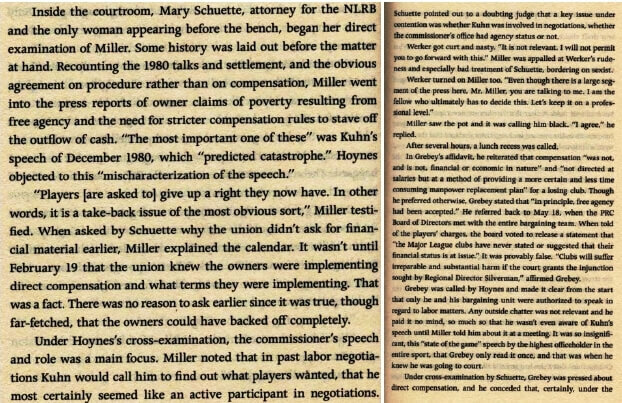 As for competitive balance, Miller could remind the Judge that before free agency the richest team, the New York Yankees, won the most World Series). 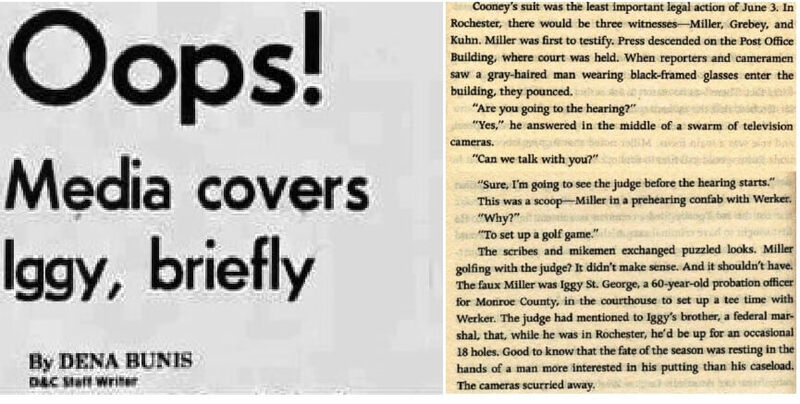 On pages 92-97 of SPLIT SEASON (below), Katz offers a blow-by-blow account culled from the court transcript and various local and national newspaper reports. 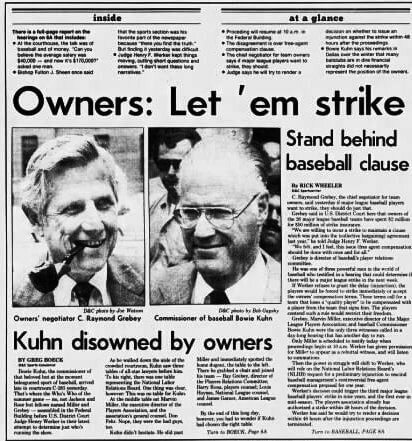 In the back and forth, prompted by Grebey, Commissioner Kuhn admitted he could not speak for the owners, prompting the D & C’s headline: “Kuhn disowned by owners.” On the union side, Miller was adamant that all he wanted was the owner’s financial data and thirty days to examine. The second day, June 4th, was only a half day. Katz says the outcome did not look good for the plaintiff, the NLRB. The ruling came on Wednesday the 1oth. No injunction. Boeck believed the decision would bring both sides to the table with a renewed sense of urgency. Boeck was probably right. As the strike progressed, the players showed more resolve than expected by the owners. On July 31st, a compromise contract was signed and play resumed on August 9th with the All Star game in Cleveland. While the contract was seen as a compromise, Katz thinks the players won more. Free agency was not rolled back; there would be no return to semi-indenturehood. Katz believes free agency added unpredictably and new excitement to the game. Super stars added lustre as their salaries reached the millions. And, higher salaries ensured that baseball could compete with football and basketball for the best young talent. The reserve clause was unfair; it was fiefdom. But for the fan, the clause enhanced the game because it kept stars on the same teams for much if not all all of their careers. The 70’s and early 80’s was the era of great dynasties. 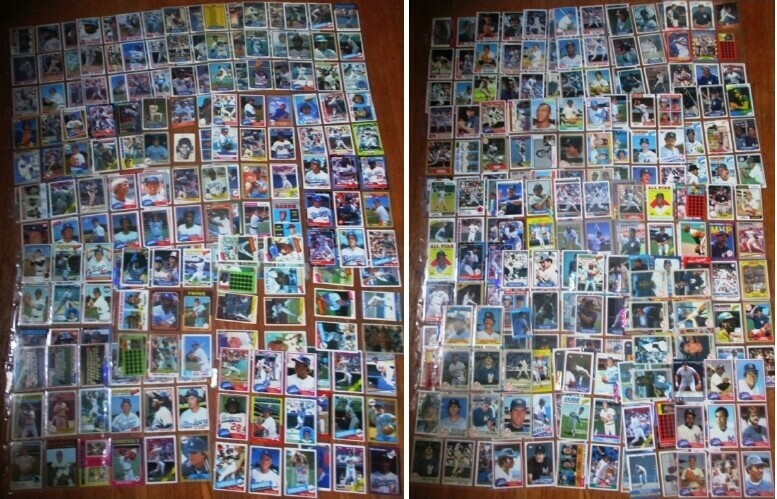 (My own baseball card collection comprises all the playoff teams from 1969 – 1983, including the ’84 Royals and ’85 Royals and Dodgers. The Orioles made 7 postseason appearances; the Yankees 5; the Royals 7; the A’s 6; the Phillies 6; the Pirates 6; the Reds 6; the Dodgers 6). In 2010, Sky Andrecheck made a spirited defense of the Reserve Clause. Andrecheck argues we could have all the virtue the reserve and still pay players what they are worth. So, disagreeing somewhat with Katz, free agency freed the players economically which was right, but maybe something can be said for the good ‘ol days. As a selfish fan, I don’t care how much money the players or the owners make. Baseball’s revenue stream is wide and strong. I’d like the profits go to growing baseball in the inner cities, fewer commercials (at the cost of less profit) and all-private investments into stadium enhancement. 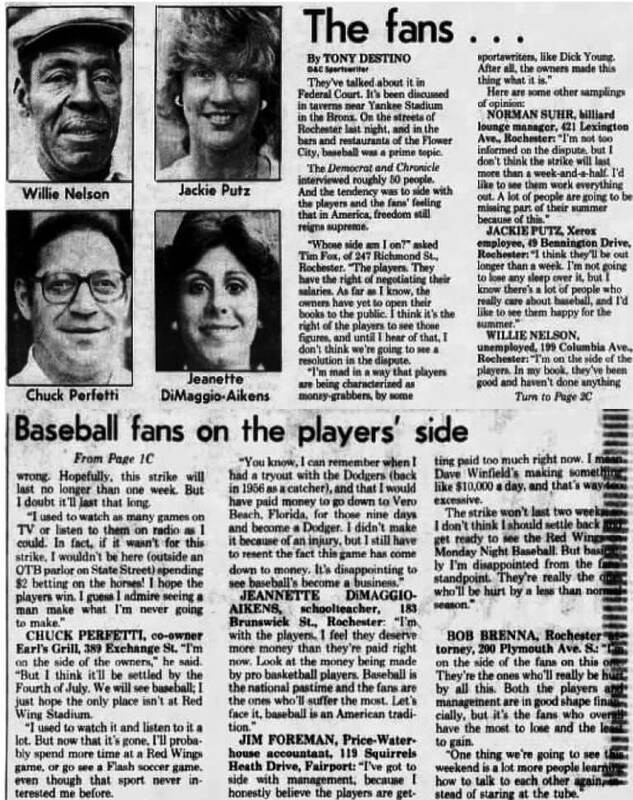 According to almost all sources, including Katz, in 1981 the majority of fans supported the players. Sportswriters who knew the facts tended to blame the owners for provoking the walkout. 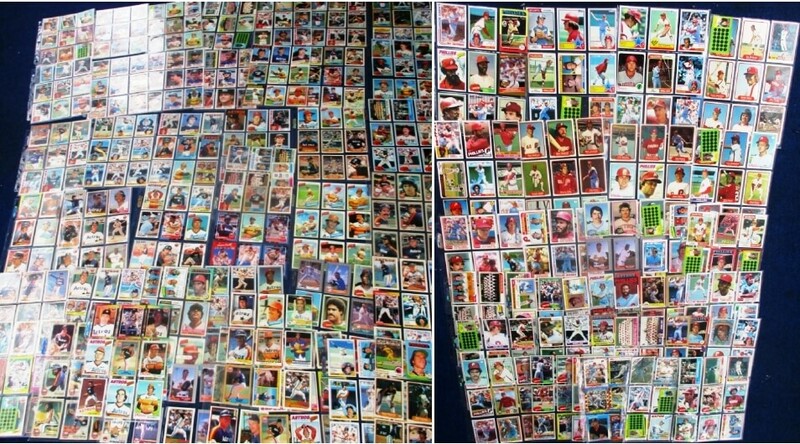 My theory is that in 1981 players were not yet superrich and only a few years before were not especially rich. Fans have often accused players of being overpaid and some resented that well-paid stars Sandy Koufax and Don Drysdale held out for more money. But most fans knew or sensed that, overall, average ballplayer got a raw deal. By contrast, in the 1994-95 lockout which robbed fans of the World Series many moaned (legitimately) that the matter was a squabble between millionaires and billionaires. If there is another strike, the moans will be louder. 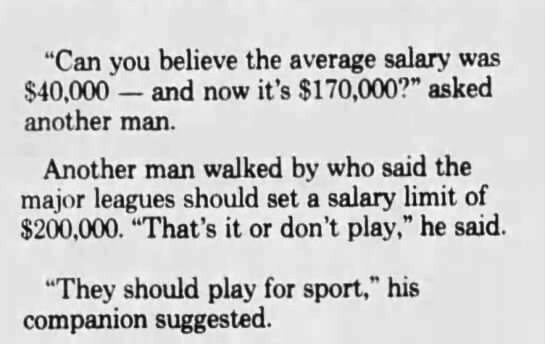 On the other side, Jim Foreman thought players were paid too much. He cited the statistic that Dave Winfield made something like $10,000 a day and concluded, “That’s way too excessive.” What would Foreman think today of Alex Rodriguez? 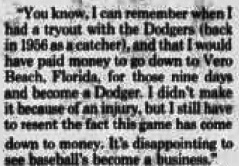 In Perfetti’s words, he would have paid to become a Dodger. Would he have worked his whole career for free? If baseball is a business for the owners, why shouldn’t it be for the players? The first speaker seems to forget the rise in salaries occurred when the players gained a right he or she exercised: the right to sell services in an open market. The second speaker’s idea to cap a player’s salary at $200,000 sounds like something out of a European social democracy (a system I doubt he or she likes). Would the speaker cap a CEO’s salary at $200,000? Would he cap his own at $200,000? The third speaker is an idealist, yearning for the days of amateurism in sports. Somehow I doubt he or she rejects, on principle, any payment for his or her job. 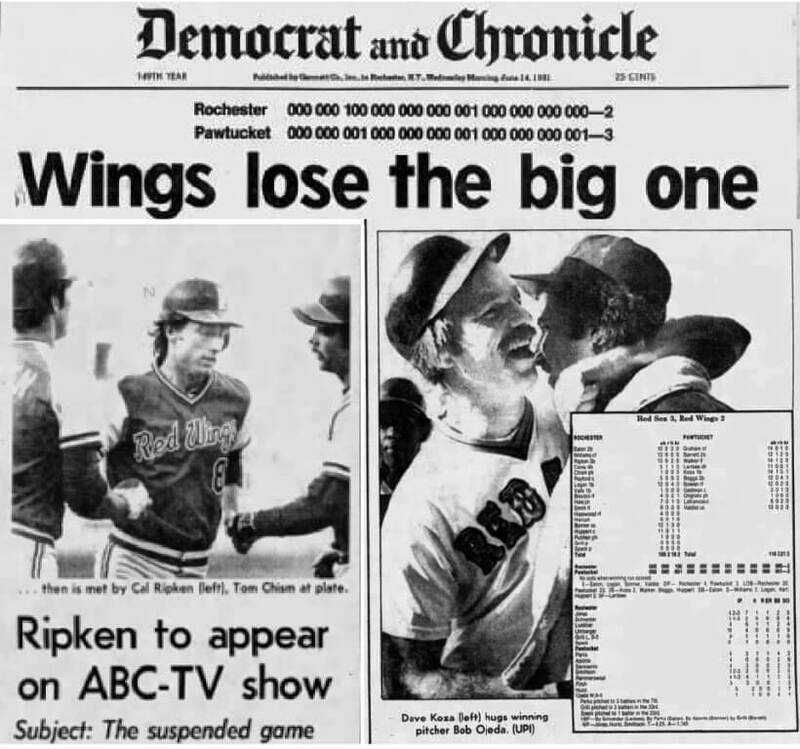 Rochester Democrat and Chronicle, (top) June 24, 1981, front page; (bottom left) June 23rd Cal Riken Jr. interviewed by ABC about the game suspended in April, (bottom right) June 24th (sports section). See 18 innings, 3:29 EST. That’s nothing. When the season resumed, the Leagues adopted a split season format and added another round of playoffs, the Division Series. The format was flawed but added new wrinkles to the pennant races (and additional revenue for both owners and players who need to refill coffers after the strike. 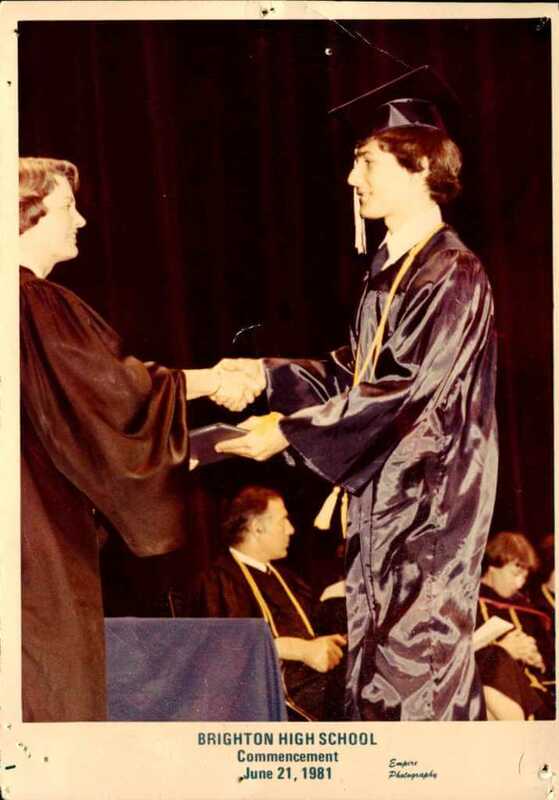 David Kramer, Brighton High School, Commencement, June 21, 1981 [Empire Photography]. I graduate during the strike and two days before the completion of the 33 inning game. In August, I followed the second half of the season intently. But in September, I was in college and away from my usual routine of watching the playoffs with my father, making it difficult to keep up. Furthermore, I didn’t have a tv, relying on a tv in the dorm common room. Unfortuantely, my school (Brown University) was stocked with hippy liberals for whom watching baseball on the communal tv was not a priority. I was able to catch glimpses on the occasions when fellow Neanderthals out numbered the Hippies. Mostly, I listened on the radio and read box scores and wrap ups in the Providence Journal. 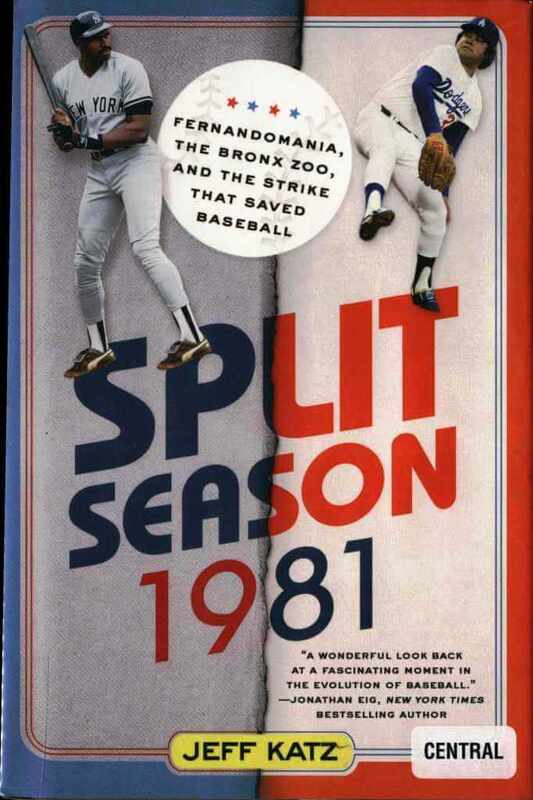 As seen in Opening Day, 1971, at Boldo’s Armory, the 1981 split season would prove a lucky one. 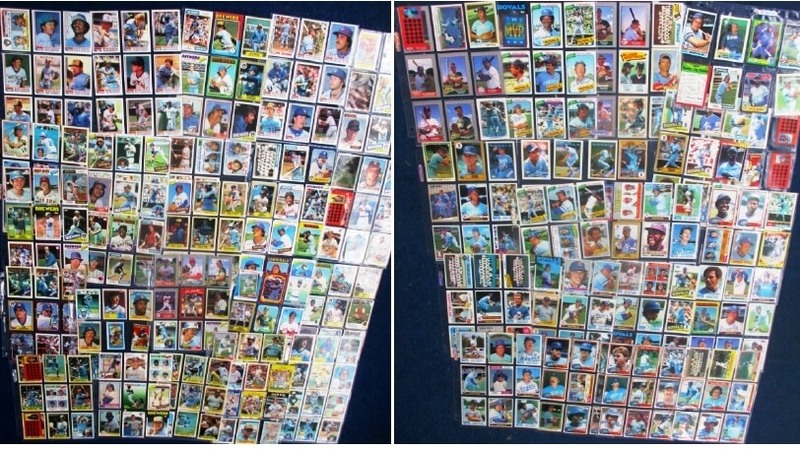 In 1982, I joined the Brown Strat-o-Matic League that used game cards from the 1981 season. I won the championship. 18 innings, 3:29 EST. That's nothing. Thumbs up for GeVa's "Thurgood"